Getting trash bags ready to wear! Russ and I are boy scouts though and came prepared with throw away gear. 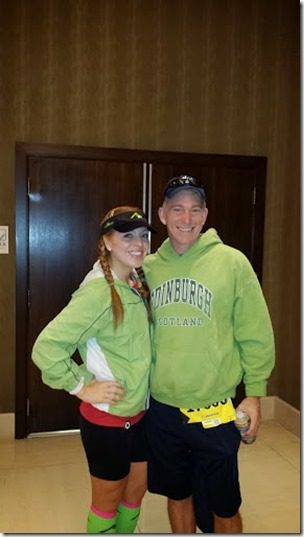 Apparently lime green is in for pre-race fashion this season… Be prepared! But it is the BEST course in the United States thanks to all the armed service men and women, landmarks, history and crowd support! I think after mile 3 it’s flat for a long time and you are really distracted by all the sights and sounds. 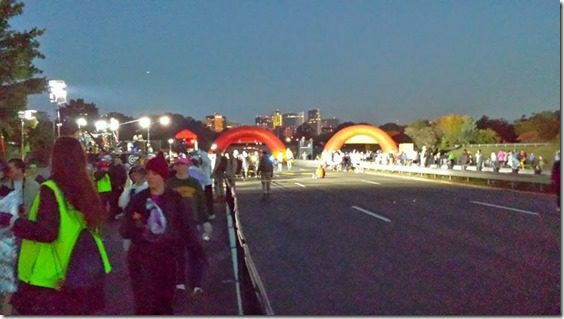 The one tiny negative about this race is – because it’s so big (30,000 runners?) it is very crowded at the beginning. That’s usual for big races, but this one didn’t thin out until mile 19! I think it would be hard to go for time here until you lined up right in the front. The last 6 miles get a bit boring until you get to Arlington National Cemetery. Then, as you get close to the end the crowds are LOUD and AWESOME. When you cross the finish there are lines and lines of service men and women waiting to shake your hand. And they present you with the medal and salute you. It’s awesome. I finished in 3:56:27 and it was no walk in the park. 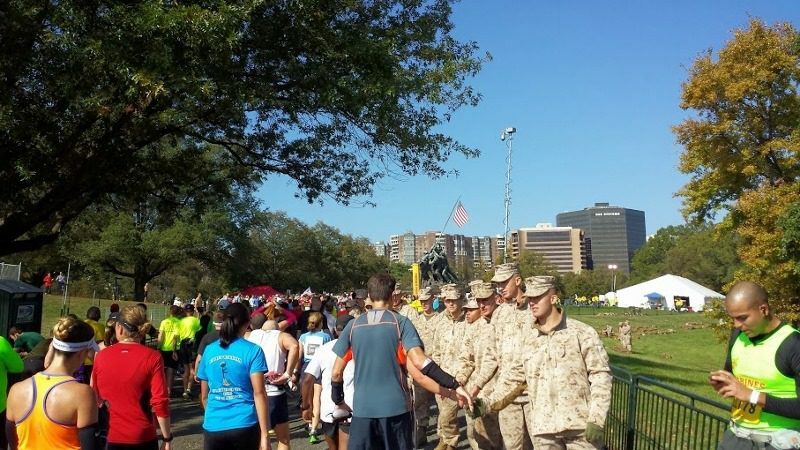 Everything about the Marine Corps Marathon was super organized. This includes the post-race food lines. 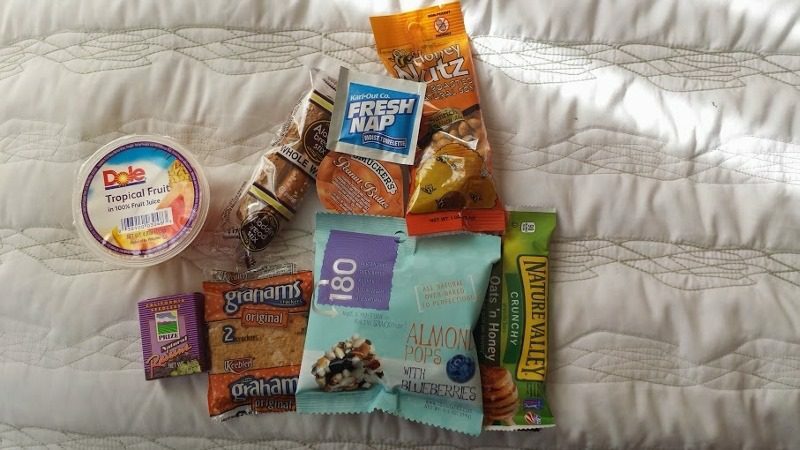 They gave you a bag, water, and then a super cute box with your food. 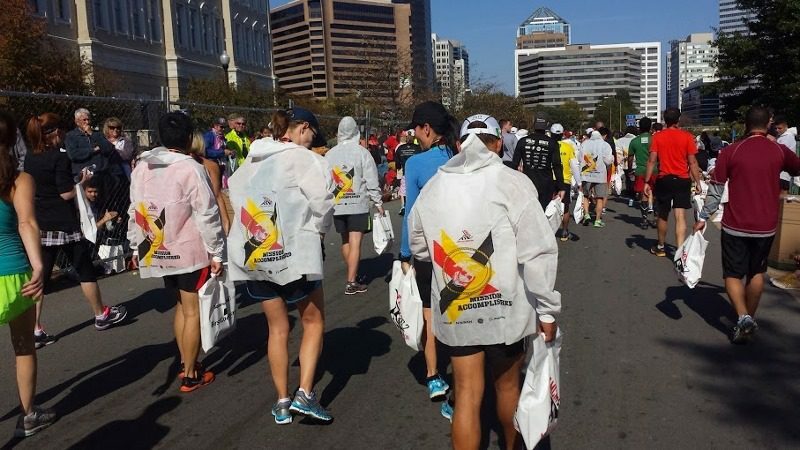 The most genius part of the post-race offerings are the light jackets they give out instead of space blankets. LOVE. Those foily blankets are so hard to keep on your shoulders while you’re trying to take a sip of water (or do anything else). These Mission Accomplished jackets are my new favorite thing. Even though I was exhausted, I somehow managed to rush over to the FREE Fresh Watermelon booth to eat all the watermelon. I made a good dent. 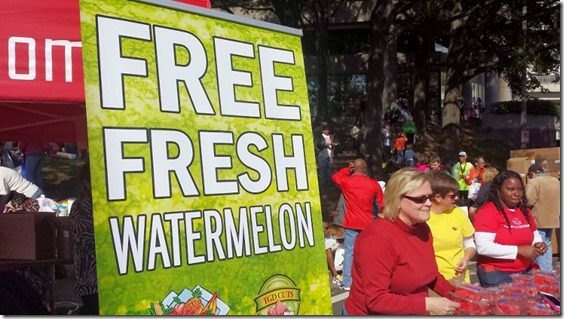 #EatMoreWatermelon but not more than me. 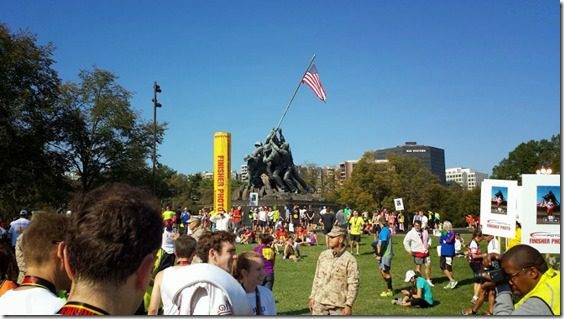 Overall thoughts: Loved everything about the Marine Corps Marathon. EVERYONE was so gracious. 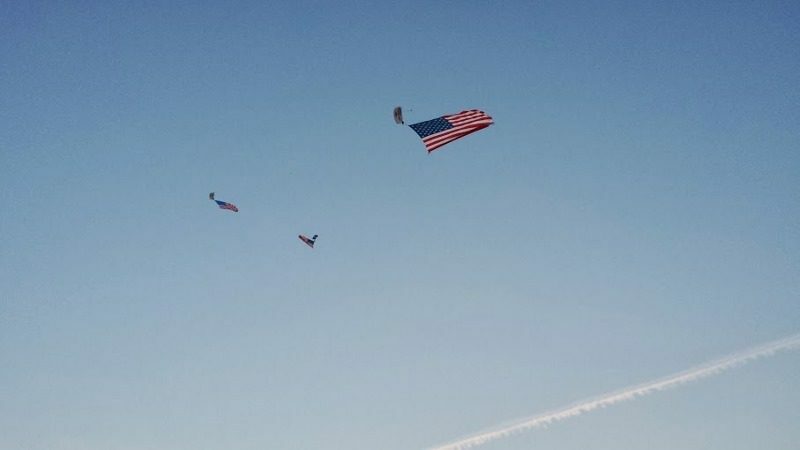 The service members kept saying “thanks for coming out” and other positive things. I thought, they are the ones defending our country, I should be thanking them! But really, it was the best. I had a hard race physically, but that is nothing compared to all the people who have died and been injured serving our country. God Bless them. Question: Do you know any vets? That last picture is of my running group–Wear Blue: Run to Remember!!! I was running!! 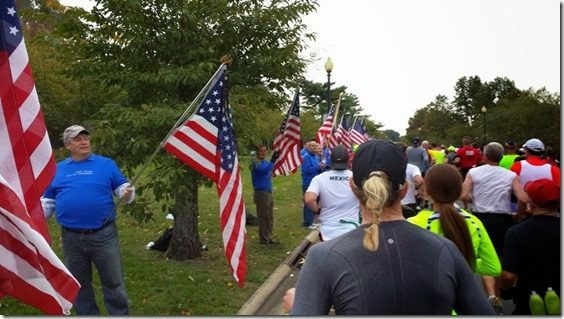 It was my first marathon and I chose it for the Wear Blue mile with all the flags. 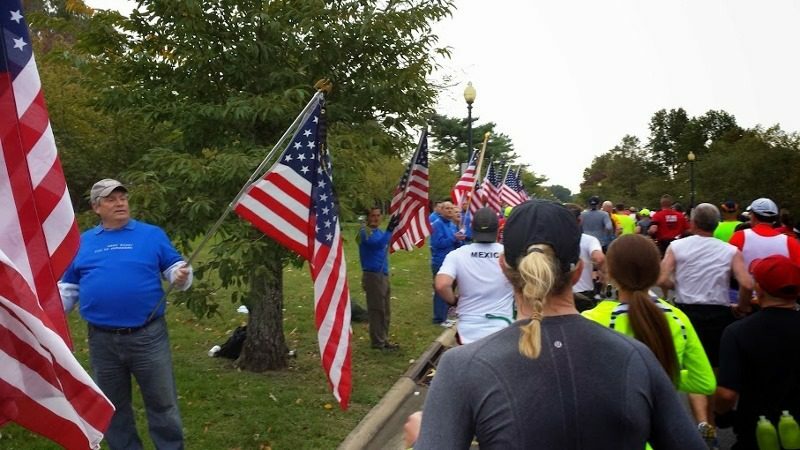 All of the posters with fallen military members photos were photos submitted by Wear Blue runners running in MCM and were photos of the individual service members we run in honor of. Glad you had a great race! Wish I had run into you though! 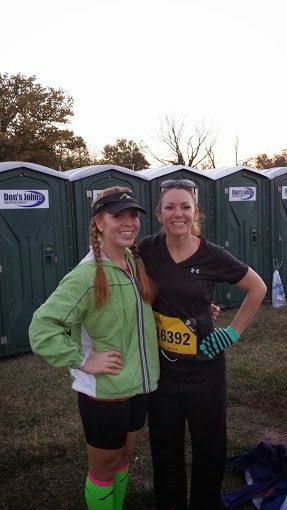 Sorry I’m late to respond, but thank you for the race recap, Monica! Both my grandfather, dad and uncle were veterans, my cousin is a veteran, and my FIL is still serving in the service! 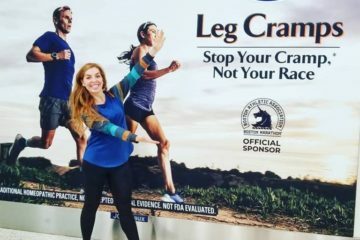 MCM was my very first marathon and I thought it was amazing!!! I’m so happy for you that it didn’t get cancelled. I want to run it 4 more times to join the “club”. 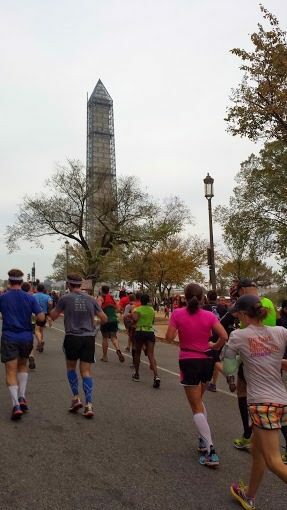 I am a Maryland native and absolutely loved how many people were out watching and cheering on the runners. My favorite part of the race when I ran it was the frat handing out beer to the runners while we were in Crystal City. 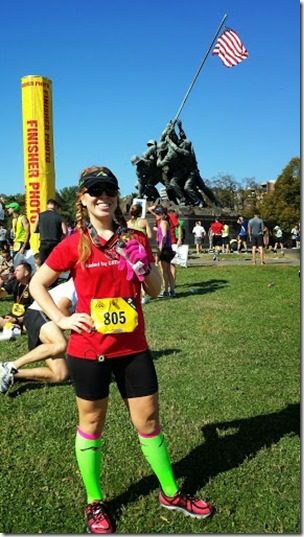 The MCM Historic half in May is an equally awesome race! The marines and all the volunteers in both races were so supportive and cheered on everyone! I just loved that race. Many races later, that is still my favorite! My grandfather was a WWII veteran! 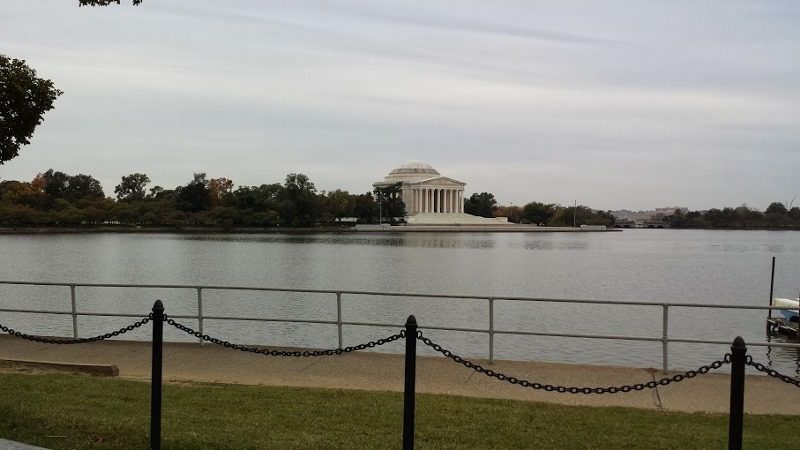 To run past that monument that recognizes him and the fellow men and women that served our country in that war is pretty amazing! Wow Monica! Congratulations! 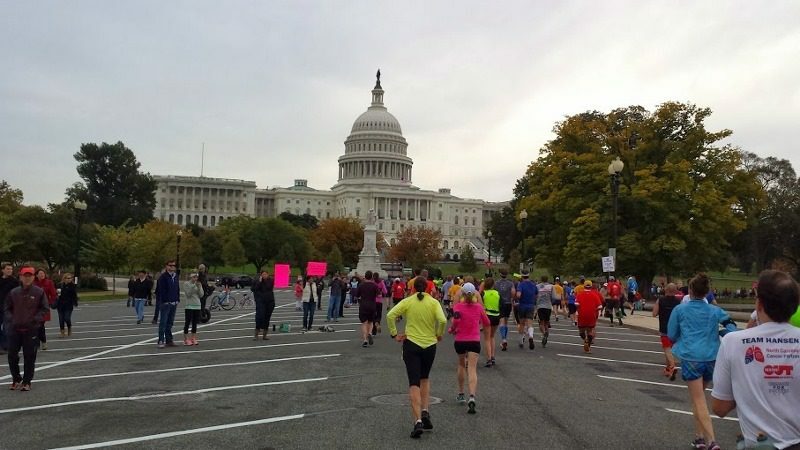 I yelled out to the runners from my car on my way home from church while everyone was running over the 395 bridge towards the Pentagon. haha I hope you heard me!! You’re such a champ! Great recap! I actually wrote about the Blue Mile (your last photo). I run for Wear Blue: Run to Remember and it was great to see so many run for the fallen and the respect shown by those who ran past it! Marine Corps was my first marathon! I had a fabulous time. Those Marines were pretty cute 😉 it was amazing to see them all along the course. Their support was incredible. I cant imagine running all the miles you have in the last few weeks. would you ever do something like this again?! props to you, though. its pretty incredible reading all your adventures lately! I don’t know if I’d do this again – I’m trying to burn myself out I think! Congrats on another speedy marathon! You’re a running machine. You should be very proud of yourself! Congrats on your finish! 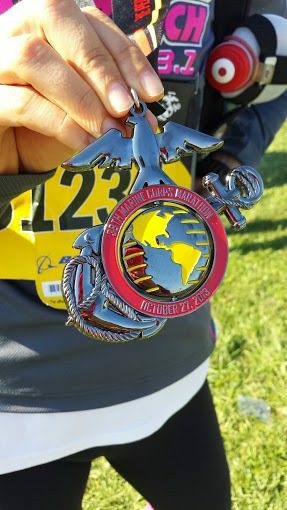 My husband and I ran it in 2010 and when I got to the finish and that Marine put the medal around my neck and said “good job” I burst into tears and said “No, thank YOU for what you do!” I still get misty eyed just thinking about that moment. 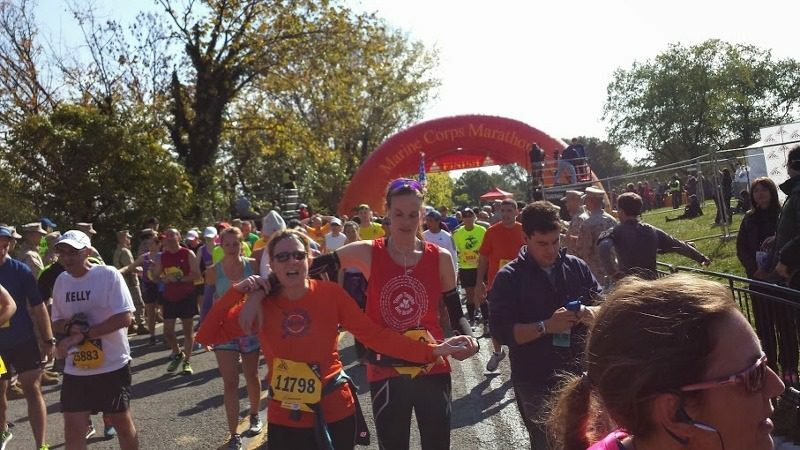 Did you bang the gong at mile 26? (If try still have that). It was also actually ON Halloween that year so lots of people were dressed in costumes. My Dad served in the Army and fought during WWII, my father-in-law was in the Navy and served in the Korean War. My brother-in-law retired from the Air Force and I have several uncles that have served as well. Wow, every recap I hear about this race solidifies it more for me that I will run it one day. 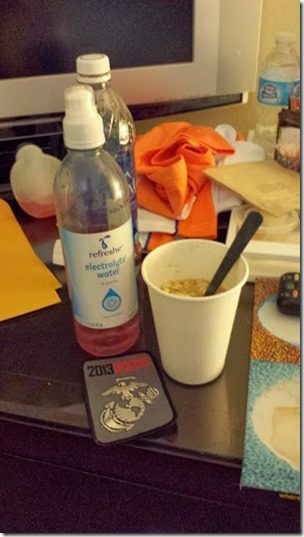 My husband is a USMC vet who was injured in Iraq, so it’s very close to my heart. Well done! My dad, 2 brothers, and my husband are retired from the Navy. My husband is a Navy SEAL vet – he’s my hero. Great recap and thanks for sharing your kind words and thoughts for our servicemen and women! 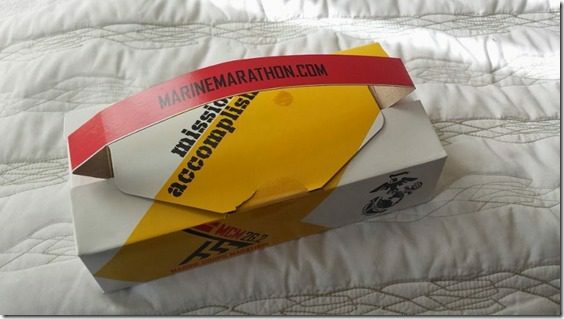 MCM is my only full marathon to date – but I hope to get back there again some day. 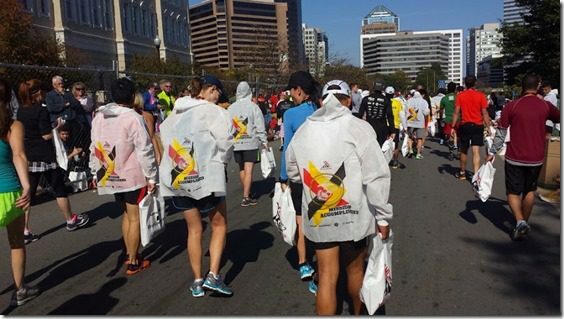 At the Atlanta Marathon we had the same jackets and snack boxes! I was very impressed. As a middle/back of the pack-er, I usually get whatever the faster folks have already picked over, so this snack box thing was great! Loved the jacket! I ran MCM last year (even Sandy couldn’t keep this event down! ), and it was so incredible. I felt like I had a runner’s high the entire race just from the course support. It as also my husband’s first full marathon and thinking it would be his only one, I felt like it was the best experience he could have had. 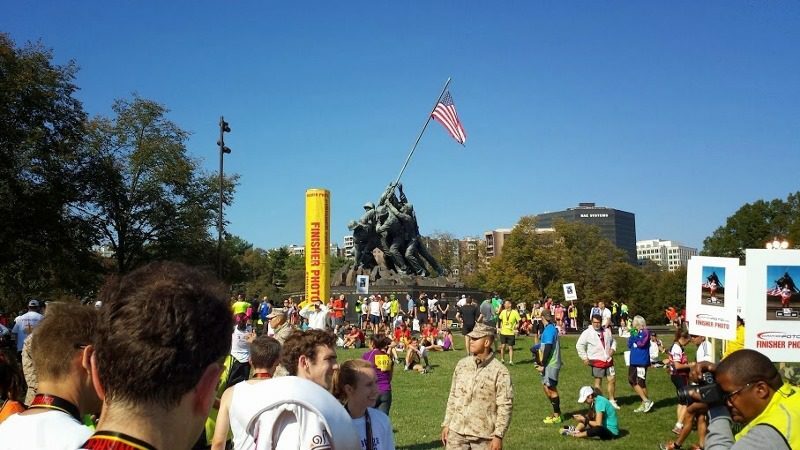 My favorite moment was after you finish and you get to shake the hands of dozens of Marines. There was one woman in the line of Marines, and I told her what a pleasure it was to shake her hand. Of course it’s organized, it’s run by Marines! 😉 My son is an active duty Marine in his 5th year and just re-enlisted for another 4. I have run this marathon 2 times and I love it! Last year I ran it mostly through tears. 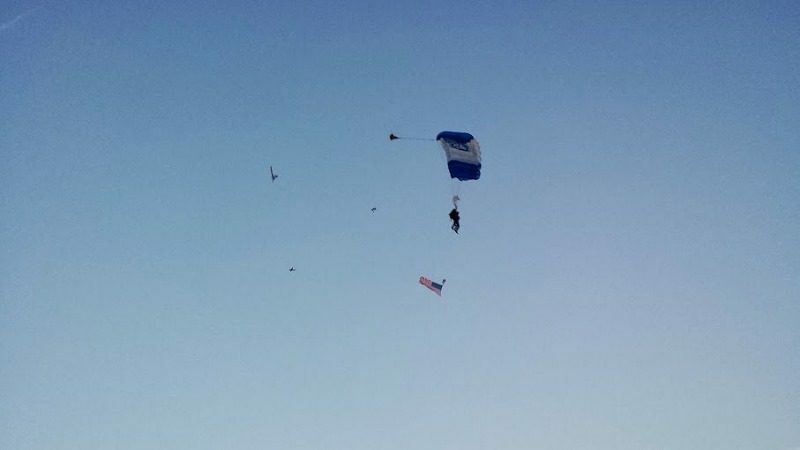 My son’s friend from HS (they enlisted together) had recently lost both his legs and had to be amputated right up to his hips so I raised money for his families favorite charity and ran it in his honor. I was chocked up through just about the whole run. Hey! Nice to meet you post race yesterday! I was the random stranger that also ran Santa Rosa 🙂 Congrats on your race! Congratulations! It looks amazing! We lived in the DC area for four years and did the MCM 10K three of those years — I think the marathon is a little better organized, but it’s so cool to run through DC and see all those Marines cheering you on, and the medal presentation at the end is the best! My husband is a Marine and he’s done the actual marathon twice, but it was before we met. If I was ever going to do a marathon, that’s definitely the one I’d choose! My Dad is a Vietnam Vet and was also a Marine. 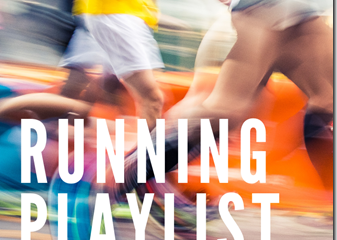 I’ve been toying with making running a marathon a goal. I think this is the one. I am crying just thinking about getting the medal from soldiers at the end. 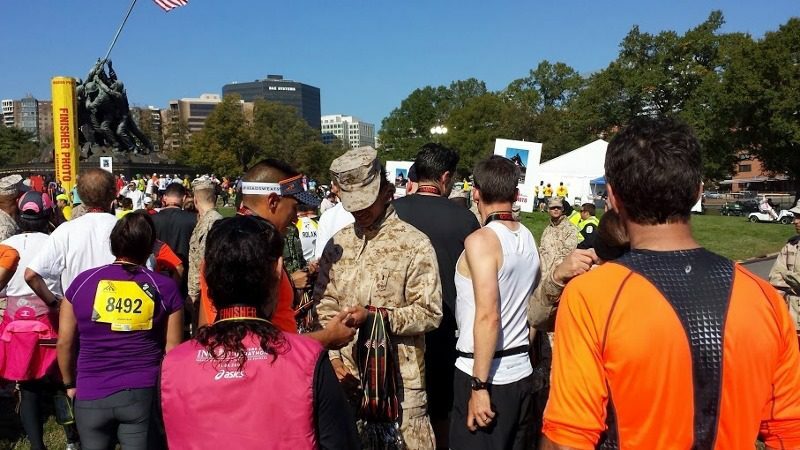 Between finishing the race and saluting soldiers I will be a blubbering mess for sure. oh, i didn’t know you were running this one! i was out there, too! haha. sad i missed you! i agree, it was an awesooooome race. Boo! I went all that way and missed ya! How’d it go? I actually saw you when I was running on the Mt. Vernon trail on Saturday afternoon. It looked like you, but I thought, “That’s crazy – what would Monica be doing here? !” Ha! It was my first Marine Corps Marathon (and I live in DC). LOVED it. I died a little on the last mile, but it is just so well organized and yes, there is nothing like seeing our military at every water station, cheering us on, etc. Great race, but yeah it was rough! How’d it go? Wow, such a cool experience! I might have to add MCM to my list of marathons to run someday. Congratulations on another marathon done!! I loved it and PR’d despite wanting to die for the last 10k. I am happy to say there was a bounty of high fives and every single paper cup went into a trash can, that’s right, because I love people who volunteer and don’t need to throw gatorade on them. Hi, Just wondering what brand/ model are the black shorts you wore for MCM? I’m looking for a pair that don’t ride up and aren’t too short. If you could let me know it would be much appreciated! This was an amazing race. I totally agree. Well done, Monica! It was my first marathon and I have nothing but good things to say about the organization and experience. It is a bit crowded but I think that kind of adds a special kind of energy in the beginning miles. It is funny but a lot of people cry at the end of the marathons but for this I cried at.the.beginning. After the National Anthem was sung, I got all choked up thinking about the sacrifices our young men and women make for this country. It was overwhelming. What a great day – it looks amazing. And inspirational. Well done Monica! The medal looks great! I could eat watermelon all day everyday! Great race! I did it two years ago. They didn’t give out those snazzy jackets two years ago. I completely agree with the inconvenience of the space blankets! See you next weekend in NYC! Congrats Monica!! 🙂 Good luck at NYCM as well! My father served 20 yrs in the USAF. 🙂 I always thought my father looked so handsome in his uniform(s). way to go!!!! now rest time :)! Congrats on a great race! What a beautiful day to run a marathon. Man this year’s box totally beats last year’s box! I picked the wrong year to run haha. I loved that jacket. I still have it, actually. My husband is a veteran and my grandpa (98) was a vet! Glad you enjoyed the race!! 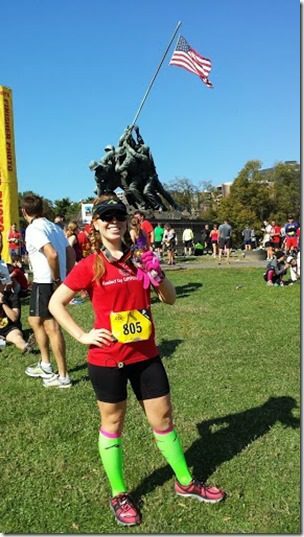 Congrats on the accomplished race, and thank you for sharing your experience and all those pictures! I guess my bucket list just grew by another event. Are you staying at the East Coast for NY next week? I saw you on the course right before the bridge at mile 20. I was star struck 🙂 Congrats, lady! I’m inspired daily by what our soldiers have done and continue to do. Thanks to all of them. I would love to run this race (eventually) and experience how great it is. Both of my granddads are veterans, I would want to run it for them. I’m sure this is a happy race, incredibly emotional. Congrats on a great race! This was my first marathon, and although I didn’t reach my (unofficial) goal of a sub-4 time, I had a really great time and enjoyed the race. And now I have a huge respect for the distance, now that I’ve experienced it. Man, those last 6 miles I was hurting. 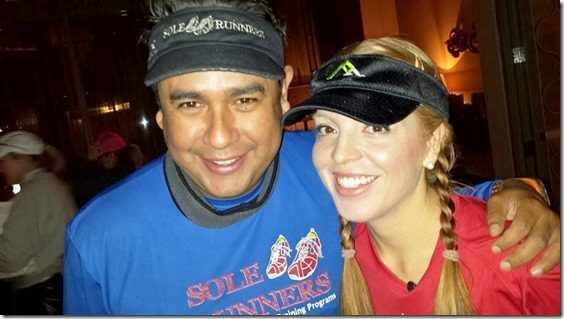 I can’t imagine running as many races as you do! Congratulations on your first marathon!!! Time to celebrate! I also ran a (half) marathon today — in those socks. We obviously have great taste. I think that this would be an awesome race to be a part of. Looks like a great, meaningful race! My dad is an Army vet and my daughters’ brother is currently serving in the Marines. He just got back to his base in California from Afghanistan last week! So proud of him and happy he’s back safe and sound! So so glad he’s back too! There were so many pictures of fallen soldiers, it’s heart-breaking. Loved this post! My husbands father was a WWII vet, my pap was Korea, my uncle Vietnam, and my mom Dessert Storm. All Army. So so proud of our vets! Can’t thank them enough for serving! Congrats on the race, and thank you for sharing your experience! 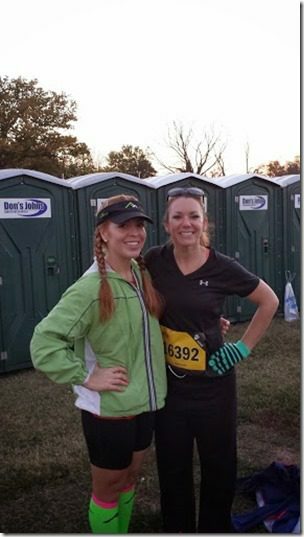 I loved reading about it, and I’m definitely adding this race to my Race Bucket List!! Thank you for reading it 🙂 It’s a pretty great race! Thanks for cheering! The crowds were amazing at this race. Your talk about the service men and women really moved me. It is so easy, when we are living our cushy lives, to forget what people sacrifice to keep us safe and living our cushy life. My brother in law is a Marine. My husband is an Air Force vet and my son is deployed with the Marines right now. Semper Fi. Thanks Alaina! And thank you to your husband! This is the first time I’ve ever been remotely tempted to run a full marathon. Great recap, such an honor to run in our capitol surrounded by heroic men and women! It really was an honor – I should have used that word in this recap all the way! 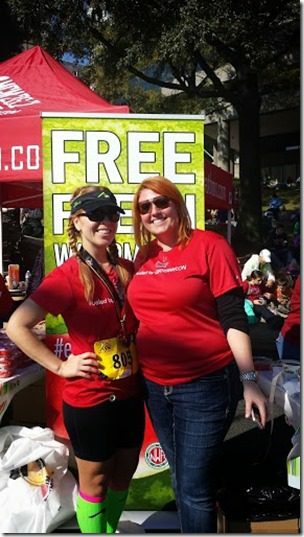 I ran this race last year and loved it! The organization, the volunteers, the course. It was all great. Maybe I will be you in NYC. Yeah! Hopefully NYC!! Not sure my schedule yet, but I’ll tweet it up when I’m headed there. This is awesome. I had a friend running it today, too, and he had the same sentiments that you did. My BIL is in Afghanistan right now. My sister and their two boys (6 and 4) are home holding down the fort and doing a great job. I can’t even imagine being away from my hubby for a year. Brett will be home in April, and we can’t wait for the big celebration! That is rough, I can’t imagine that either. Your SIL must be a strong woman. Was it you I saw mile 20-something? My brother is a vet, and a marine vet to boot! This is officially added to my race bucket list! It was on my bucket list! 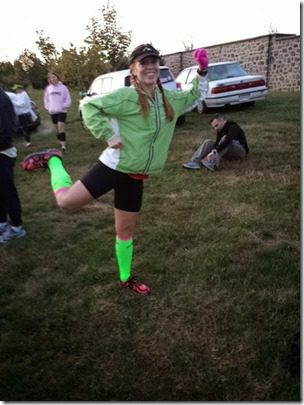 Yay, wonderful pics and race report. Congrats to you! I ran it in 1998, (I’m an Air Force vet) and my son (US Coast Guard officer) ran in 2010 & 2011. It *is* a great run— glad you enjoyed the experience. Good luck at NYC! Awesome! Thank you for your service. Great race! You have been a busy women, it amazes me how you can run so many races with such great times! My hubby is a Marine Vet and my brother is currently in Afghanistan serving the Army. 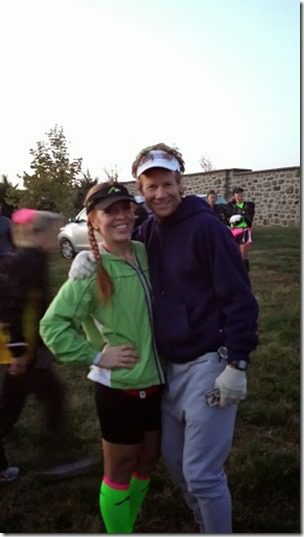 I would love to get out there next year and run this race in honor of them both! That would be awesome! It’s such an inspiring race. Congrats! Best part of my day was spotting you at Mile 23. I was with the crazy people cheering in blue. I yelled out your name like you would know who I am, hahaha! Thanks for waving! The course is very difficult, in my opinion. Not flat. You did great! Thanks for the blog, you inspired to run my first 50K this year, and back to back marathons. Love reading every day!